The Castle of Santa Catalina is a 17th century castle built for defensive purposes to defend the northern side of La Caleta beach. 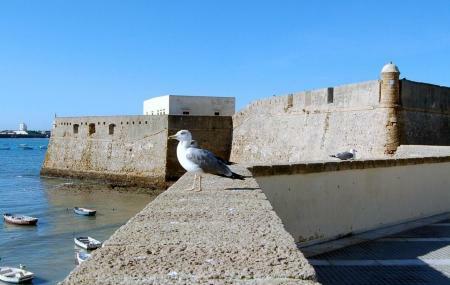 Spread across a vast area, the castle provides beautiful views of the sea and the city of Cadiz. The premises of the property are now used as an exhibition centre and concert hall. Free tours of the Castle are conducted by the Tourism office of Cadiz. How popular is Castle Of Santa Catalina? People normally club together Gran Teatro Falla and Castle Of San Sebastian while planning their visit to Castle Of Santa Catalina. Free fort/home to art galleries and expositions with great views of the sea. Worth a visit as you walk along the coast. My first visit to this gorgeous port town with incredibly generous people was one of my favorite trips in my life. The architecture is beautiful and interesting, the local market has fabulous fresh seafood, produce, olives, cheeses and meats. Everything was so fresh and delicious. The beaches are gorgeous and they are accessible, it's a very accessible place for wheelchairs and power wheelchairs! The Castillo de Santa Catalina reminds us all of the European invasions and looting, and what gorgeous views! Put it on your list! Interesting little piece of history in a beautiful sleepy coastal town. Worth stopping by if you're in the area. To our surprise Caldiz had a wonderful Seafood Festival!!! Fun and tasty!! So beautiful and surprising. It is worthvisiting.